Jim Capaldi was born on August 2, 1944. In his teenage years he learned to play the drums. Since then, Jim made a career for himself as drummer with bands like the Hellions and Traffic. In 1972, he released his first solo album, 'Oh how we danced'. Ten years and ten albums later, he had his first and only American top 40 hit: 'That's love', taken from the album 'Fierce heart' which was produced by Steve Winwood. The single reached number 28. The single was also released in the Netherlands, where it didn't chart. 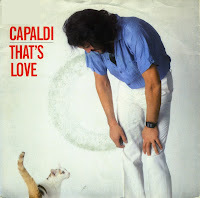 Capaldi died of stomach cancer on January 28, 2005. He is survived by his wife and daughters.